SUN & HELIOCARE - I Blog, Therefore I Am. Much as I've wanted to regularly soak under the sun and go to the beach...I can't! I have Rosacea and my #1 enemy is the Sun. Rosacea makes my face really red with nasty bumps called papules and pustules on a daily basis. This has been my dilemma for the past months. I used to ignore it but it's becoming quite irritating lately. I've tried a lot of topical creams/gels and I am now even on Doxycyclin but my face is still far from clearing up. I have good days but I also have a lot of bad days. I am now undergoing Laser Genesis and I am hoping that it will give me some relief since it's quite an investment (!!!). Plus - I am now on my 4th Derm for this "case". My teenage acne and break-outs were definitely easier to manage. The best I can do about my Rosacea for now is to "fake it" and avoid further damage. 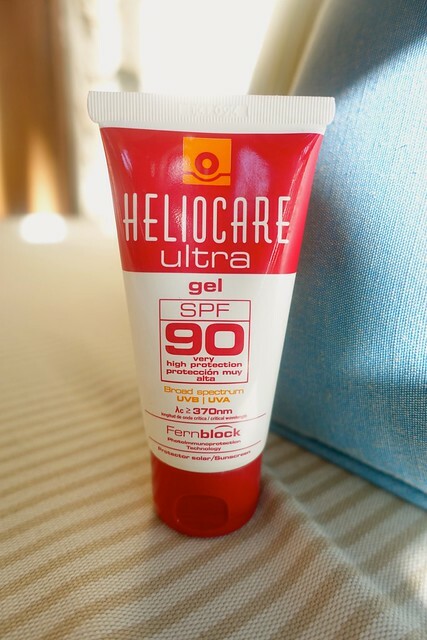 One of the best creams that my 3rd Dermatologist prescribed to me was the Heliocare Ultra Gel with 90 SPF sunscreen. I was advised to get a higher than 70 SPF sunblock to avoid more redness and flare ups/ It's working for me so far and I've been using it for two months already on a daily basis. It does it job very well! I am not as red as before and I am now confident to brave the sun even on its strongest. The write-up on their website says that Heliocare is for people who are not used to having sun protection. I agree because I am very guilty of this. It acts like a make-up base. I hardly use make-up, concealer, or foundation since my skin is highly sensitive so Heliocare acts like a primer for me. It unfortunately cannot stand alone (oil and shine) so I just finish it with a VMV Hypoallergenic Illuminants 25 Powder Foundation. The powder glides very well with the sunblock. Heliocare with VMV helps me hide the bumps and redness. It helps me with the bumps (papules and pustules). I noticed that I have more bumps on days when I don't use Heliocare. It has ingredients which aids prevention of skin irritations. I also don't break-out on Heliocare. Hiyang na hiyang! I avoid selfies but this is just a show and tell on how I can "fake" Rosacea with Heliocare and VMV. I highly recommend Heliocare (this is not a sponsored review by the way). It gives the coverage and protection that I want and it aids in my Rosacea. The true test of Heliocare came when I went to Shangri-La Boracay last weekend. I applied it on days when I spent a lot of time under the sun and it protected me all throughout. I'm not as red compared to beach days of long ago when I used another sunscreen brand. There's also a Heliocare SPF 50 formulation for people who feels that SPF 70 is too much. The only problem I have with Heliocare is the scent. I generally don't like creams or gels with fragrance. Heliocare unfortunately has a strong vanilla-like scent that I don't particularly like. BUT it's something which I can live with. The price is also a bit of a concern since a 50ml. tube is Php 2,500 ($56.50 USD). A tube can last for 2 - 3 months 8 - 9 months of daily use. I was able to buy Heliocare at Renergy Dermatology and Laser Center in Serendra. You can also follow Heliocare Philippines' Facebook Page for more information. Best Skin Advise I Can Give: Use Sunblock Daily! 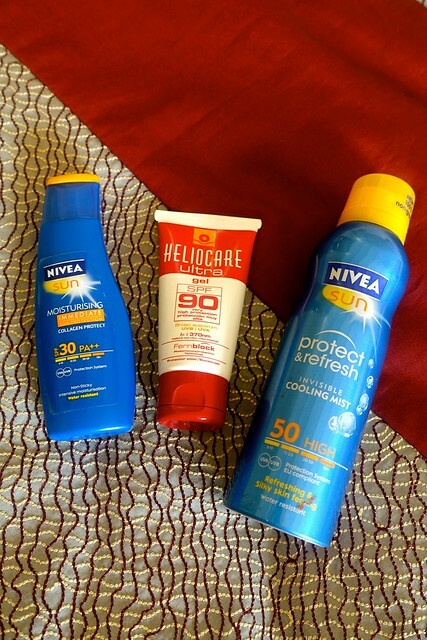 I use Heliocare for my face and Nivea Sun for the body. Belo Sun Expert is also good. I've been very delinquent on skin care and I am now paying the price for it. Sunblock is truly one of the most important daily skin regimen that one must have. Sun exposure brings a lot of irritants and skin conditions to our face and body. I've actually been evangelizing and advocating the use of sunblock daily to people these days. 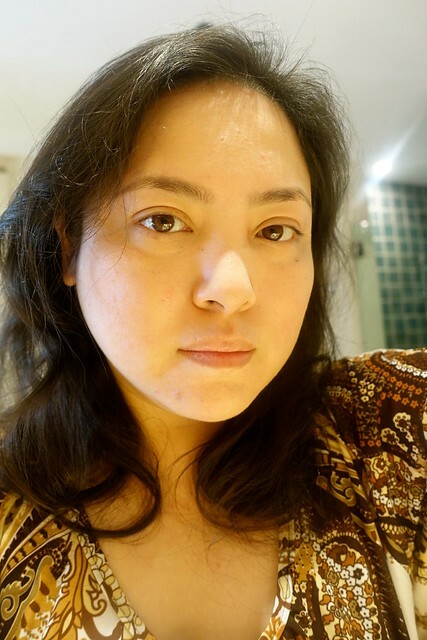 I'm now faithful to Heliocare especially now that I have full-blown Rosacea and is nearing the big 4-0 (yikes). Try it! I think so! Haven't asked. Hi miss abbie.. im suffering from rosacea too..hear me out. hi miss abbie.. i have rosacea too..
hi good pm moss abbie, congrats on your wedding.. update naman po dito sa "case" nyo... are u still using desowen, how long can we use desowen? Thanks for your review. I like this product - I also have rosacea. Can I add that what made a massive improvement to my Rosacea was getting anti-allergy pillow covers (for the control of dust mite). For me it was an almost overnight improvement. hi there just wondering if someone could give me a place to buy heliocare antioxidant pills in the philippines?